* Due to the downloadable nature of this product, there are no refunds. All sales final. 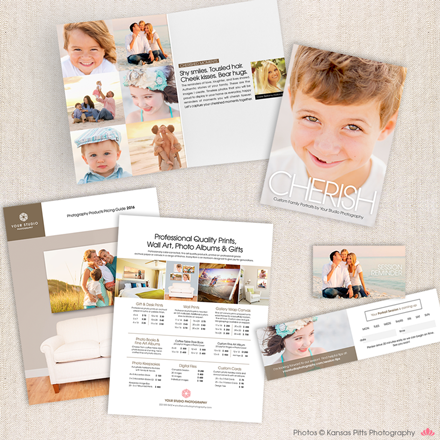 * Featured images and logo are not included with templates. For illustration only. * Section titles are word art graphics. Links to alternate free fonts are provided. 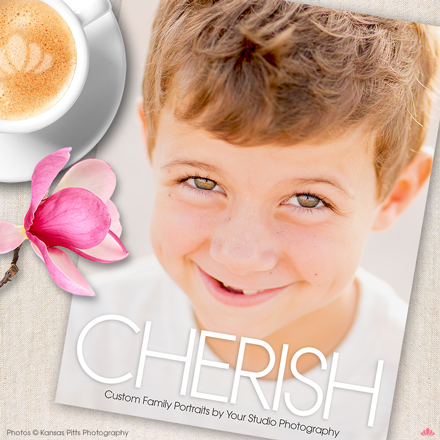 Promote your custom portrait photography, respond to client inquiries, and create a great first impression with our CHERISH promotional brochure/welcome guide, along with a coordinated suite of professionally designed marketing and sales tools. 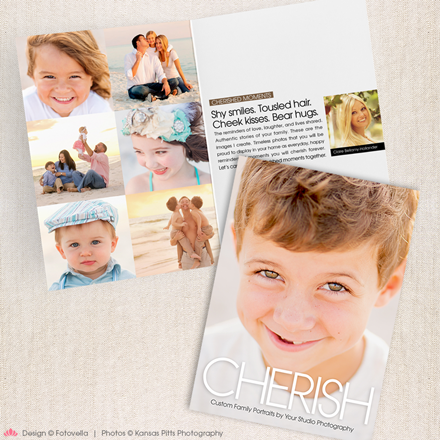 The “CHERISH” portrait photography marketing collection from FOTOVELLA includes a 24 page promotional brochure / welcome guide, a product pricing guide, folded promotional card, and folded session reminder card - each designed with a crisp, contemporary editorial style. Bold, minimalist design gives this marketing collection an upscale feel designed to position you as the ultimate professional. 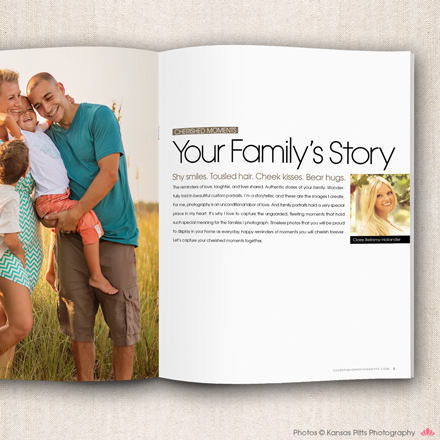 The professionally pre-written text has an engaging, easy reading style for instant emotional appeal. 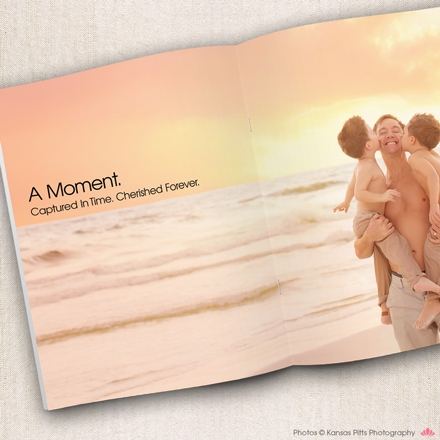 Used as a promotional brochure, a welcome guide, or both, it’s an ideal way to guide your clients and immediately establish your value as a professional photographer. 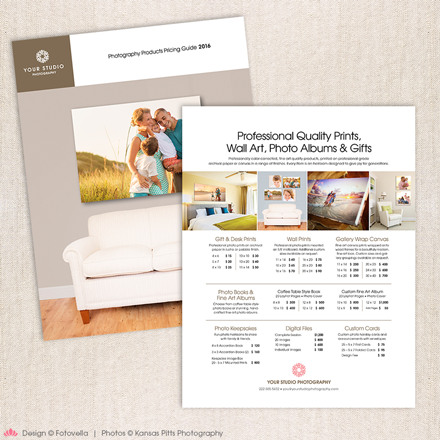 2 Files Included: Front & Back - 8.5" x 11.0"
Very special thanks to Kansas Pitts Photography for the use of her wonderful images! 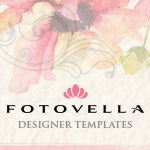 FOTOVELLA is a boutique design studio specializing in designer Photoshop product templates and studio marketing materials for professional photographers. 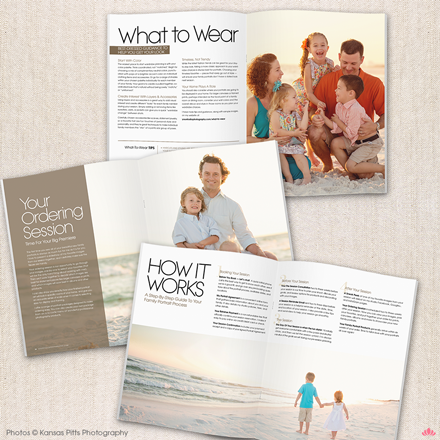 Our growing line of templates are super easy-to-use with color-coded layers, built-in "drag-&-drop" clipping masks, and easy-to-follow instructions — all designed to save you time, wow your clients, and help grow your business. "This template was amazing!! 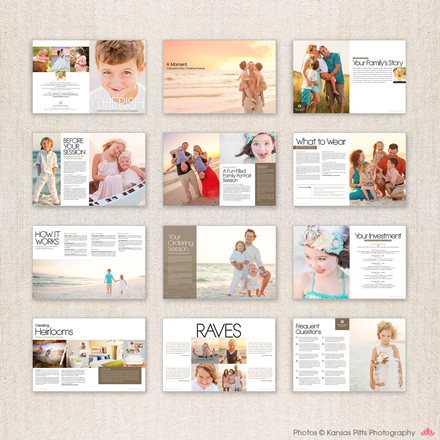 I have been in the business for the last 20 years and have used many templates over the years. By far, this was the most well thought out one ever! Clear instructions, logical layers which left nothing unexplained, and beautifully laid out pages with some of the text very pertinent to my business. Even the price page was spot on with what I charge and how I run my sales. THANKS FOR THE GREAT WORK!!" - Dave W.
"Fantastic product. Exactly as advertised. Probably most valuable to me (beyond the quality and design) was how incredibly perfect and seamless and easy it was for me to export for print. That's what I was most worried about since it was my first time trying to export something like this for a big project. 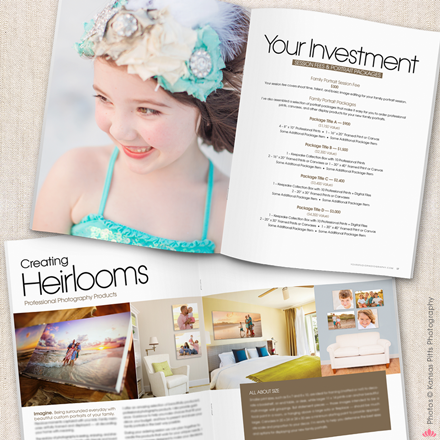 Details that I was unfamiliar with such as print margins and bleed zones and document dimensions are clearly explained step-by-step and were a total piece of cake!" 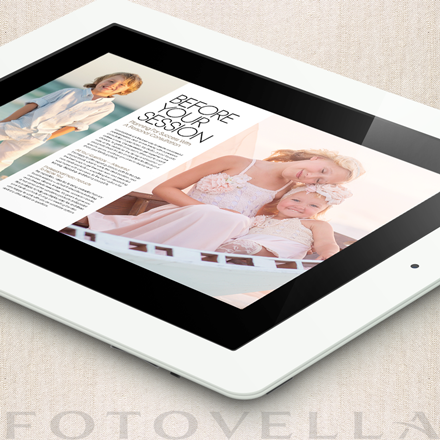 - Alan D.
"Love the minimalist clean look and that everything was there for me. I didn't have to spend hours or even days trying to put this together and the templates are easy to use. :)" - Roxanne R.